Combine all ingredients except pecans and melted butter and spread in 2 qt oven safe dish sprayed with no stick spray. Top with pecans and drizzle with melted butter. 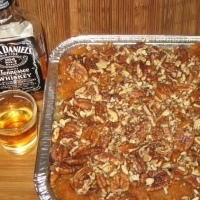 These were very good I did break out the good scotch since that's what we had on had and I did add a little brown sugar to the topping. These are a very easy to make and a great flavor! Thanks Keni! Thanks Keni. I had these at Mrs. Mary Bobo's, a well known restaurant in Lynchburg Tn. where Jack Daniels is made. Very tasty I must say! whew! I love them sweet taters...but that whiskey will knock me out cold! These sound good tho'!